LONDON — Thieves snatched some of Sweden's crown jewels before escaping in a speedboat as part of a Hollywood-style heist in broad daylight. Police used helicopters to chase the culprits Tuesday, but no arrests have been made. 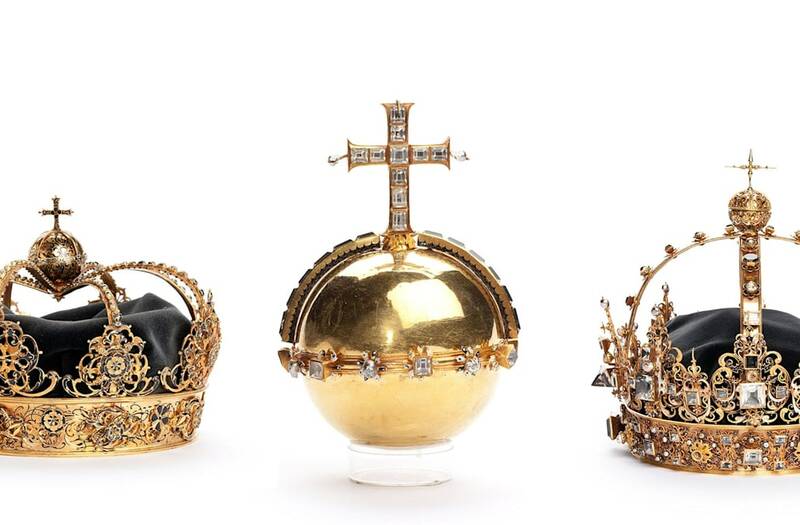 Two 17th-century crowns originally belonging to King Karl IX and Queen Kristina were stolen along with a royal orb, officials said. They are made of gold, precious stones and pearls. The items were locked away in alarmed displays at Strängnäs Cathedral, which is located west of Stockholm. The raid happened just before noon local time (6 a.m. ET) on Tuesday when the site was open to tourists. The thieves are believed to have escaped using a vast network of nearby lakes. Eyewitness Tom Rowsell told NBC News' Swedish partner Aftonbladet that he saw two men jump into a "little white boat." He added: "We contacted the police and they told us they had taken something from the cathedral." The stolen crown jewels as far back as 1611 and were originally buried with King Karl IX and Queen Kristina. They were later exhumed. Maria Elliott, an official with the Swedish police's National Operations Department, told the local TT news agency Wednesday that the items would be "impossible to sell."